Myodil (iodophenylundecylic acid, a fatty acid) is an oil-based positive contrast media that has been widely used in myelography, ventriculography, and cisternography. However, the use of oil-based contrast agents has been stopped long ago because of the potentially severe complications arising from their usage, including arachnoiditis and anaphylaxis. Thus, images of remnant material of intradural oil-based contrast are rarely encountered nowadays. We present a patient in whom incidentally detected myodil remnants were seen on computed tomography (CT). Additionally, we obtained and present the follow-up CT and magnetic resonance images (MRI) of this patient. A 73-year old female patient suffering from abdominal pain presented to the emergency department. She had been recently diagnosed with non-Hodgkin lymphoma. Erect abdominal radiographic examination was carried out in order to rule out pneumoperitoneum or ileus. Numerous high-density droplets, superimposing on thoracic and lumbar vertebrae, were noted. A detailed physical examination and blood/urine studies revealed that she was having a urinary tract infection. For further investigation of the unusual densities seen on the radiographic images, a thoracolumbar vertebral CT examination was performed. This scan demonstrated numerous high-density droplets within the thoracic and lumbar subarachnoid space apart from the findings of a previous surgery performed at the L4-5 level [Figure 1]a and [Figure 1]b. Upon further questioning of the patient, we were informed that she had been operated upon for a lumbar disc herniation 30 years ago and she barely recalled having an imaging procedure, presumably a myelography. The patient was discharged after the effective treatment of the ongoing urinary tract infection. She came back 6 months later with left-sided flank pain, and abdominal CT examination was performed to rule out a kidney stone. No change in the high-density droplets within the thoracic and lumbar subarachnoid space was detected. Dorso-lumbar MRI was performed for further evaluation of these lesions. They were barely visible on MRI and appeared hyperintense on T1-weighted (T1-W) [Figure 2]a and and hypointense on T2-weighted (T2-W) [Figure 2]b images, respectively. Myodil (formerly manufactured by Glaxo Laboratories (London, UK); also known as pantopaque in the USA) remained a widely used substance in myelography, ventriculography, and cisternography as an oil-based positive contrast media, until the late 1980s. The need for myelography decreased considerably in modern radiological practice and the usage and production of myodil was terminated in 1988. The side effects of myodil such as arachnoidal adhesions and cyst formation causing spinal cord syringomelia, compression, or nerve root irritation have been reported extensively., Currently, there are still action groups worldwide that help and support victims suffering from myodil-related complications. Myodil can remain in the thecal sac for years after a procedure due to its slow absorption rate and a long half-life. It usually appears as intradural droplets similar to a string of pearls. It can be detected easily with radiographs and CT scans as radiopaque droplets throughout the spinal canal and even in the intracranial compartment. The diagnosis of intradural oil-based contrast agent droplets on magnetic resonance imaging may be challenging for young radiologists and neurosurgeons who have not been exposed to this entity before. The MRI findings of remnants of an intradural oil-based contrast agent have been previously reported by Oo et al. Fat and fat-like structures show high-signal intensity on T1-weighted (W) imaging and low-signal intensity on T2-W imaging, according to the basic principles of MRI. Myodil has a short T1 and T2 relaxation time and can mimic fat or hemorrhage. Typically, myodil appears hyperintense on T1-W images; and, iso-to-hypointense lesions have been described on T2-W MRI studies, depending on the repetition and echo times. Therefore, a lipoma, hemangioma or hemorrhage should be considered in the differential diagnosis of residual myodil on MRI. An intradural oil-based contrast agent mimicking a spinal lipoma on MR images has been reported by Suojanen et al., in 1988. Radiologists and neurosurgeons should be aware of this entity when atypical images as seen in our case are encountered in their clinical practice. Hugh AE. The subdural space of spine: A lymphatic sink? Myodil's last message. Clin Anat 2010;23:829-39. Barsoum AH, Cannillo KL. 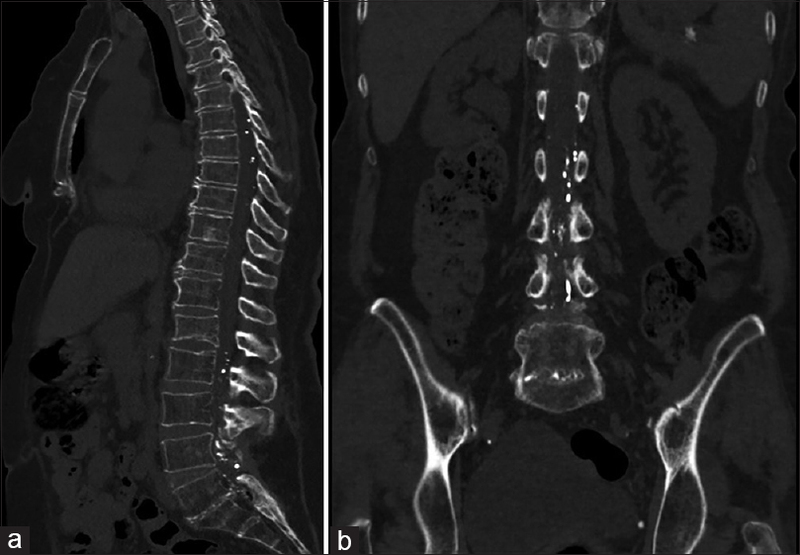 Thoracic constrictive arachnoiditis after pantopaque myelography: Report of two cases. Neurosurgery 1980;6:314-6. Shah J, Patkar D, Parmar H, Prasad S, Varma R. Arachnoiditis associated with arachnoid cyst formation and cord tethering following myelography: Magnetic resonance features. Australas Radiol 2001;45:236-9. Oo M, Wang Z, Sakakibara T, Kasai Y. Magnetic resonance imaging findings of remnants of an intradural oil-based contrast agent: Report of a case. 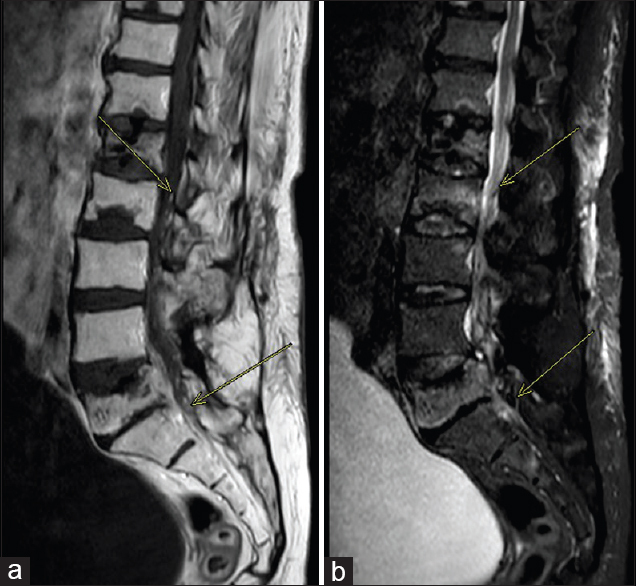 J Spinal Cord Med 2012;35:187-90. Braun IF, Malko JA, Davis PC, Hoffman Jr JC, Jacobs LH. The behavior of pantopaque on MR:In vivo and in vitro analysis. AJNR Am J Neuroradiol 1986;7:997-1001. Suojanen J, Wang AM, Winston KR. Pantopaque mimicking spinal lipoma: MR pitfall. J Comput Assist Tomogr 1988;12:346-8.